Nepal Travel 6 days, Experience Nepal is the holiday trip of leisure and forest activities in Kathmandu and Chitwan National Park respectively. Kathmandu is the capital city of Nepal. Furthermore, this is the cultural hub of Nepal which has 7 world heritage sites. Next, Chitwan National Park is the 1st national park in Nepal. It is located in the plain area of south central Nepal. It has dense forests and grassy plains which are the home of many rare mammals, numerous bird species, and crocodiles. Next day, our professional guide takes you on the heritage tour of four different cultural heritage. UNESCO has also inscribed them as the world heritage sites. First, you visit Swoyambhunath. It is a remarkable Buddha’s stupa famous as monkey temple. It lies on the hill top of western Kathmandu thus from where you can see Kathmandu valley in the greater distance. Second, you visit Kathmandu Durbar Square. It is the palace of former Kingdom of Nepal. It has the cluster of different temples and monuments made on Nepalese owned architecture. Third, you travel around Boudhanath. It is the largest Buddha temple in Nepal and also the holiest Buddhist temple outside Tibet. The surrounding of the temple is also called Little Tibet because every day many Tibetan refugees make around this temple with prayer wheel and garland. Fourth, you go to Pashupatinath. It is one of the holiest Shiva temples in the earth. Since it is one of the great shiva’s temples, here, you can see many Shiva temples, can meet many Hindu Sages and observe live cremation activity on the bank of the Bagmati River. Another day you head to Chitwan National Park by the drive. Probably, this is one of Asia’s well-protected areas. In Chitwan, you will spend two nights and involve in different national park activities. Elephant back safari grants you to encounter with rhinos and different animals. Canoeing in Rapti River gets you to see gharial crocodiles. Similarly, you also participate other activities like forest walks, visit of elephant breeding center, bird watching, elephant bathing, walk into the Tharu’s village and their cultural show. Lastly, from Chitwan National Park you return to Kathmandu. Here, you end your trip of Nepal Travel 6 days with farewell dinner at typical Nepali restaurant with delightful traditional dances. 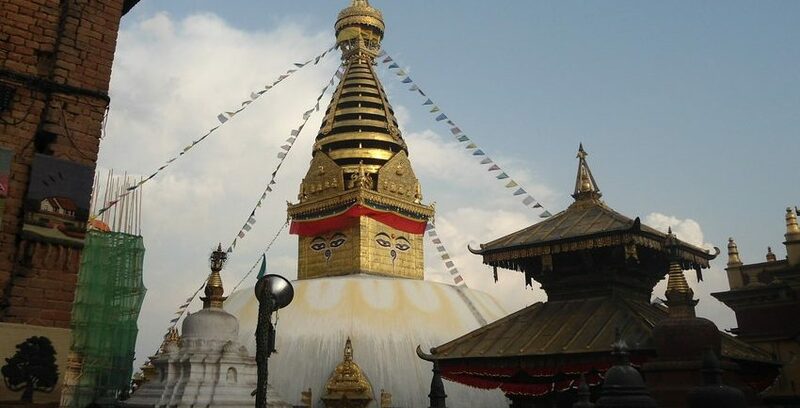 Nepal Travel 6 days is a wonderful holiday trip of Nepal. You can make it further exciting by joining in extra activities/ side trips. As the interest of people is different from each other, we have put these extra activities as optional tours. They are not included in your package cost. On your request, we offer you. The list of optional activities is displayed in right column. Highlight: Elephant back safari to explore rhino/ Canoe Ride in the Rapti river/ Forest Walk/ Visit of Elephant Breeding Center/ Elephant bathing. Highlight: Scenic drive from Chitwan National Park to Kathmandu. Free time of shopping/ Culture Show and dinner with Nepali Cuisine. Day 6: Departure from Katmandu, Nepal.